Europe Marine Coatings Market Share is expected to expand significantly with more than 5% CAGR during the projected timeframe. The harsh marine conditions and increasing bio fouling are influencing the vessels to be layered with various marine coatings to prevent corrosion and anti-fouling for longer period of time. Moreover, increased use of eco friendly coatings due to the strict environmental regulations will propel the Europe marine coatings market size in the near future. The Europe marine coatings market value exceeded USD 1.5 Billion in 2017 and is expected to rise at a CAGR of over 5.8% from 2018 to 2025. 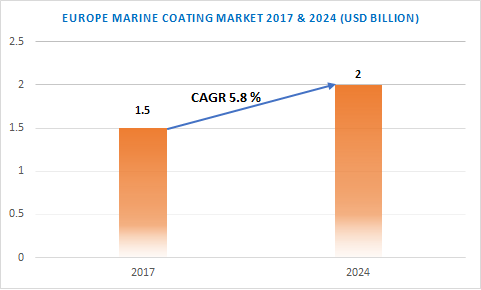 Volatile pricing of the product due to the lack of raw material availability and strict environmental regulations from EU Biocidal Products Regulation (BPR) can act as a barrier in the growth of Europe marine coatings market size by 2025. However, the increasing production of eco friendly coatings which not only reduces the marine pollution but also surges the fuel efficiency of the vessels will positively augment the Europe marine coatings market size in the forecast period. Based on the products, Europe marine coatings market size is segmented into foul release, anti-corrosion, anti-fouling, and other coatings. Anti-corrosion coatings are extensively in large sized ships such as cargo vessels, luxury cruisers etc. These ships are comprised of 90% steel and approximately 25% of the global steel production is ruined by corrosion. Furthermore, the corrosion process gets amplified when in salt water which would grow the demand for anti-corrosion coatings directly augmenting the Europe marine coatings market size in the forecast timespan. According to its applications, the Europe marine coatings market is divided into deep sea, containers, coastal, leisure boats, offshore vessels and other vessels. The Europe marine coatings market for deep sea vessels accounted over USD 300 millions in 2017 and is projected to grow over 5% by 2025. Europe marine coatings market size is expected to grow with a CAGR over 5.5% by 2025. In 2014, Europe controlled and owned the largest fleet of ships including 450 million gross tones and 23,000 vessels. Europe dominated around 40% of the global shipping industry which will drive the Europe marine coatings market size in the near future. Europe marine coatings market size is shared among various European marine coatings manufacturing contributors. Some of these key players involved in the business are Akzo Nobel Coatings, BASF Coatings, SigmaKalon Group BV, ICI Paints, Jotun Paints (Europe) Ltd, Kuraray Europe GmbH, PPG Europe, Sherwin Williams, Sika and Supreme Paints and Coatings.